All that apple picking really got me into the fall mindset. Since then, I’ve been thinking about all the fun stuff to do this season. Because I’m a little OCD, I like writing activities down that I want to do. That way, if we’re ever sitting at home with nothing to do, I pull out my list and we have instant ideas on what to do to fill our time. Also, I find that if I make a list, I’ll start scheduling the activities that require a little planning ahead. With a busy schedule, planning ahead really helps. I planned on writing down my to do list on the chalkboard we made for the office, but then decided against it. I wanted the list to be prominently displayed along with the rest of our seasonal decorations. I looked online for some printables of this sort, but wasn’t finding anything that I liked or that suited the activities Dan and I would want to do. So, I made my own. I’m sure there is a MUCH better way to have created this, but I think it turned out all right in the end. 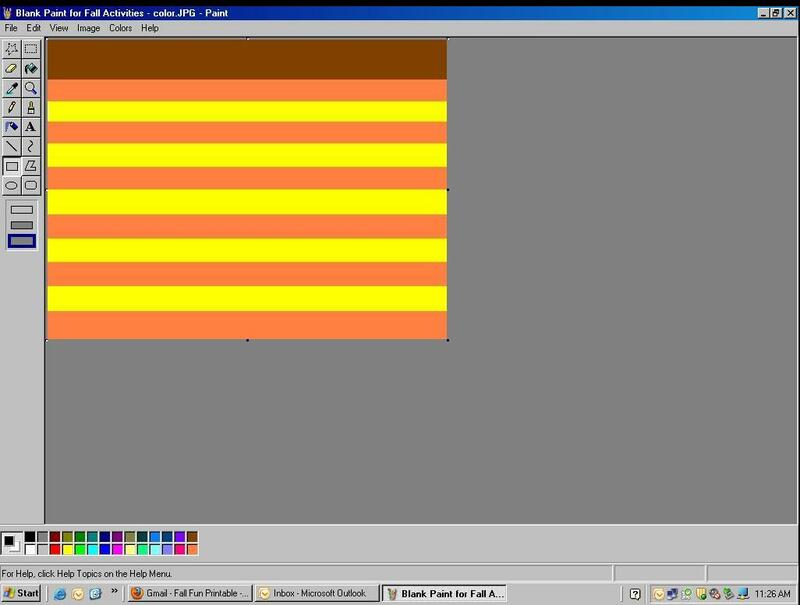 I started by creating boxes filled with each color in Paint, saving it as a picture. Then, I uploaded the “picture” to Picnik.com, where I added all the text. Finally, I saved the photo as a jpeg, for easy printing. I framed my list in a frame I already had. I put the glass in to create a sort of dry erase board where I can check off the activities as we do them. 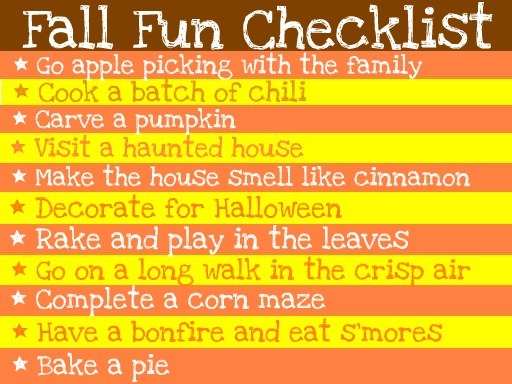 I’ve already checked off apple picking with the family, making chili, and making the house smell like cinnamon. I burned a candle that smelled like cinnamon buns last weekend. It went much better than the soy Yankee Candle pumpkin one. Feel free to print your own copy! Did I miss any of your favorite fall activities? I also recommend Powerpoint for making shapes and text things.If you ever want to get REALLY fancy, get a copy of Adobe Photoshop or Illustrator (maybe Dan already has it or can get a bootleg from work). I used Adobe to make every figure, illustration, etc. while in graduate school. It takes a bit of getting-used-to, but you can do amazing creative things. I like your fall list very much and envy it as I study the branches of the facial nerve! Thanks, Lauren. I actually thought about using Photoshop, but decided against it based on my limited knowledge of it. Dan definitely has it on our home computer, so maybe I’ll get him to give me a tutorial on it soon.Maybe some day, you can take a break from facial nerve studying and actually do something on the list! If you guys figure out how to do a bonfire, count me in! I’ve been wanting to roast s’mores all summer. Ha, thanks Diana. In the city, we don’t really do bonfires, as you know. I didn’t even have my first real s’more until I was about 20! No, that will likely be an activity left for when we visit Dan’s parents or or brother and sister in law out in the burbs. Maybe try to toast a marshmallow on a kitchen stove burner? I know, I know, it’s not the same. Good luck! Thanks, Cindy, but be careful what you’re offering. Before you know it, you’ll have a gang of unruly twenty-somethings in your backyard demanding chocolate, marshmallows, and graham crackers! Seriously though, thank you for the offer! We might have to take you up on it!